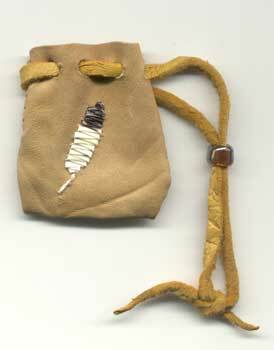 A feather quilled on a leather pouch using the stitches taught in the Porcupine Quillwork Part 2 Class. Make your New Year’s resolution to try something new! I’ll be teaching Porcupine Quillwork classes this coming weekend, January 8, 2011, at the Museum of Indian Culture starting at 10 a.m. The classes give you the chance to sample this ancient Native American art that entails embroidering porcupine quills onto leather or wrapping them around rawhide. The class includes all the supplies you need to get started on your own quillwork projects. Download the flier to sign up. This entry was posted in About and tagged class, porcupine quill by Susan. Bookmark the permalink.